Shop@MustardSeed: Your belly button - an Innie or an Outie? 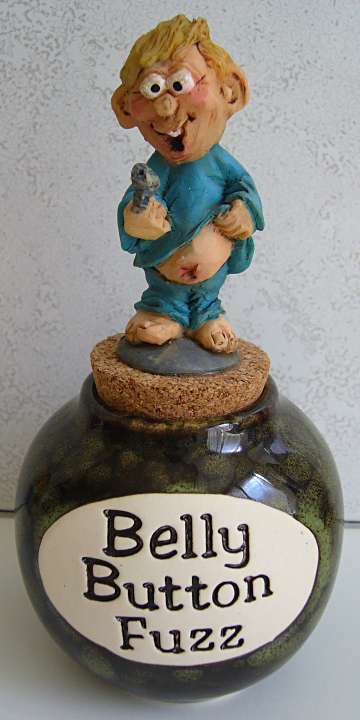 Your belly button - an Innie or an Outie? Innie or Outie? There were undoubtedly many such naval questions being asked on the Titanic exactly 100 years ago, as the waist band played on. Apparently, most of the 36,000 oranges on board had Outies. But we digress surely. 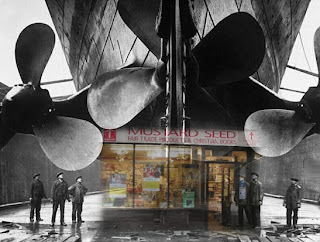 The sinking had nothing to do with the Mustard Seed - or did it? Well - it did in a way. You see - the iceberg that reared up out of the glassy black sea seemed to come from nowhere, because those naval gazers could see no breaking waves. If only there had been a Fair Trade Wind then the sea would have been more choppy. 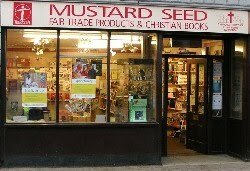 Or in the context of the Mustard Seed - should that read shoppy? Anyway - it's clear that the Fair Trade bit makes waves & therefore saves lives. 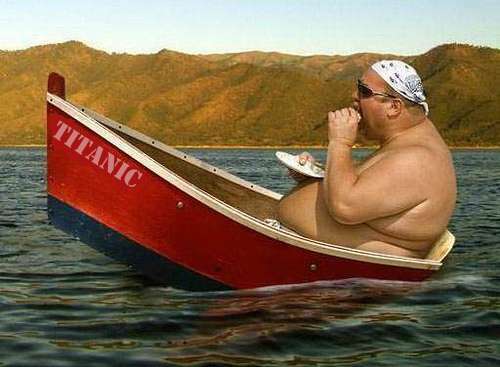 Of course - if Titanic hadn't been built in Belfast then we could easily have built it in Faringdon. 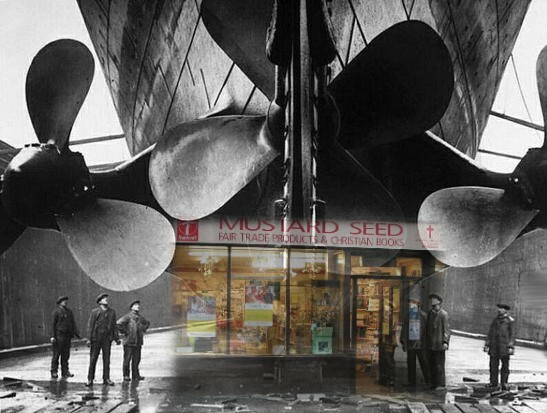 The photo shows the propellers being assembled in the Cornmarket. The prow would then be sticking through to the tennis club, which is handy because they are good at painting lines. So we could ask them to do the name. TITAN ICE . That's what it was originally called (unfortunate choice of name if you ask me) , but they ran out of white paint in Belfast and had to drop the E . The tennis club has plenty of white paint. And it would cost less too - because we wouldn't bother with that fake fourth funnel - which was a complete accident by the way. It was the Chief Designer who happened to overhear a conversation between the Chairman & his wife Helen. Ah - there's another link with the Mustard Seed. You see - you probably know her better as Helen of Troy - but her full name was actually Helen of Troydcraft - well known as the face that launched a thousand Troydcraft shops . Anyway - back to that overheard conversation. Helen: Darling - what are you putting up on the top deck? Chairman: It's going to be just for fun Helen - for the first class . And the Chief Designer scurried off to modify his plans - having clearly heard It's going to be just four funnellen ... (he had a German great aunt who also spoke like this) . Then there's the 3200 eiderdowns that need stuffing. Faringdon's Innies (Outies are less productive in this respect) would be drafted in to produce the necessary naval fluff. Softer than mohair. 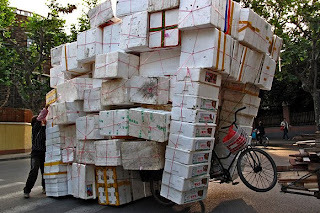 In the photo you can see how all those Fairtrade provisions could be delivered sustainably. None of that naughty coal stuff. Sorry - that should have read nautical stuff. P.S. What d'you reckon? Innie or Outie?